THE UNGASAN Clifftop Resort has officially launched their Wellness Retreats and I had the absolute pleasure of taking part in one. I truly felt that this Wellness Destination was next level Amazing it was so feel good and beautiful. It was something truly magnificent and special. Everywhere I looked it felt good and I felt instantly well from simply arriving and being there and that was even before I started any of their wellness activities that is how lovely their resort was. 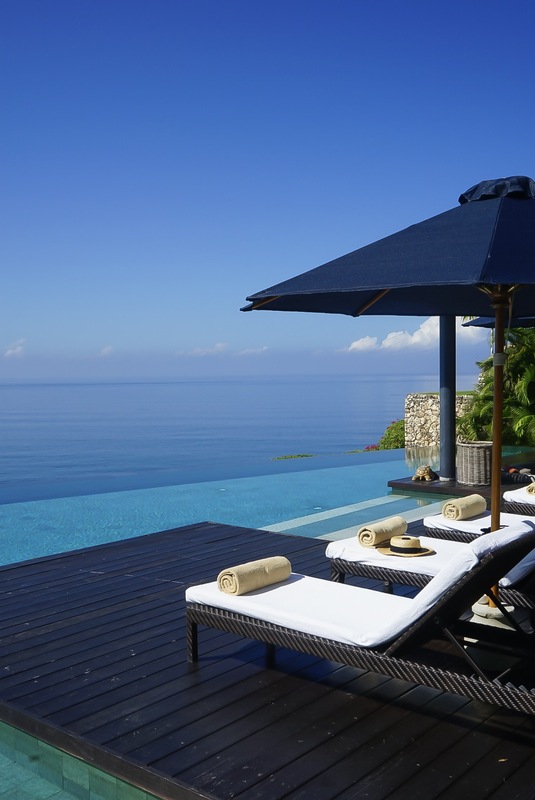 I absolutely loved staying at THE UNGASAN Clifftop Resort every time I looked at the infinity pool with endless views of the ocean I was mesmerised by the beautiful shades of feel good ocean blue. I also loved listening to the waves of the ocean and I felt the sea breeze air. I met so many beautiful like minded women on the Wellness Retreat whilst at the same time focusing my attention inwards on my own health and wellness needs. 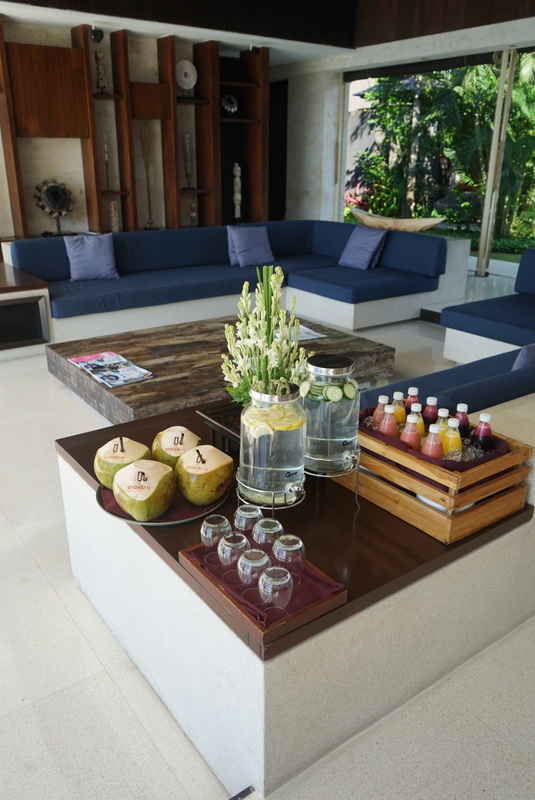 The Wellness Retreat started out with a lovely meet and greet a fresh coconut water and meeting the very gorgeous yoga and meditation teacher Laura who was absolutely beautiful inside and out. It was so lovely as the first evening we simply got to chill and Laura took us through a guided meditation and after it was I felt totally at peace and deeply relaxed from within my busy go getter media mind had totally stopped and now I was clear and totally in the present moment. The first night we all got to sit around and talk mingle whilst THE UNGASN Clifftop Resort – Executive Chef, Josh Tyler cooked on the BBQ fresh healthy food which catered for every dietary requirement it was such a beautiful evening. The Next Morning when I woke up and the took part in the Morning Sunrise Yoga class with Laura which I really loved. Getting down to the Yoga Spot at The Beach Club was an adventure in itself as you have to take a Cable Cart down to The Beach Club and Beach Front. 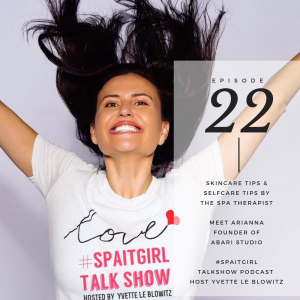 If you click on my below @Spaitgirl IGTV Show you will be able to see what I mean. It’s currently the Wet Season at the moment in Bali so whilst I was doing the Morning Sunrise Yoga, I am not going to lie I found it personally hot, but with a Towel and some Water I was able to stick it out and at the end I truly felt like I had sweated out my toxins and I felt so awake and ready to take on the day and I was on a Yoga High. 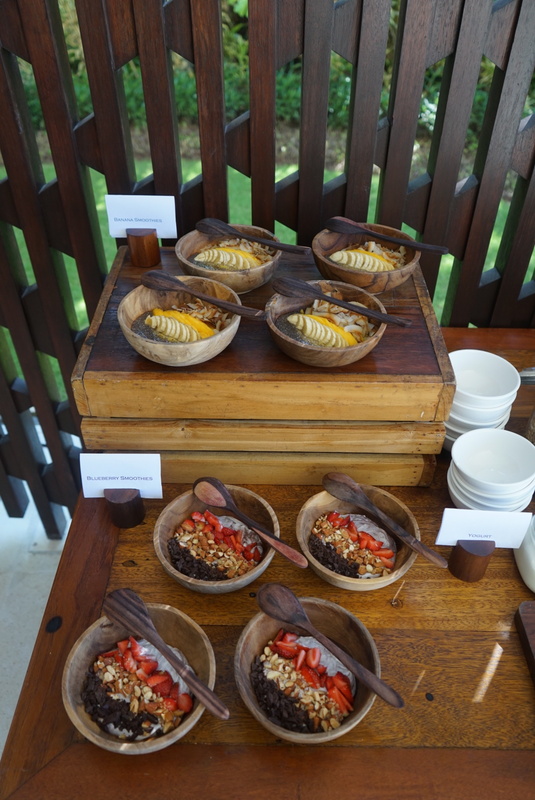 After our Morning Yoga we got to have a delicious healthy breakfast the presentation of the food on offer was amazing, spot on and the taste of the food was so delicious – OMG the Executive Chef Josh Tyler and his team totally nailed it with my favourite of all being the blueberry smoothie bowls all of the food was amazing. 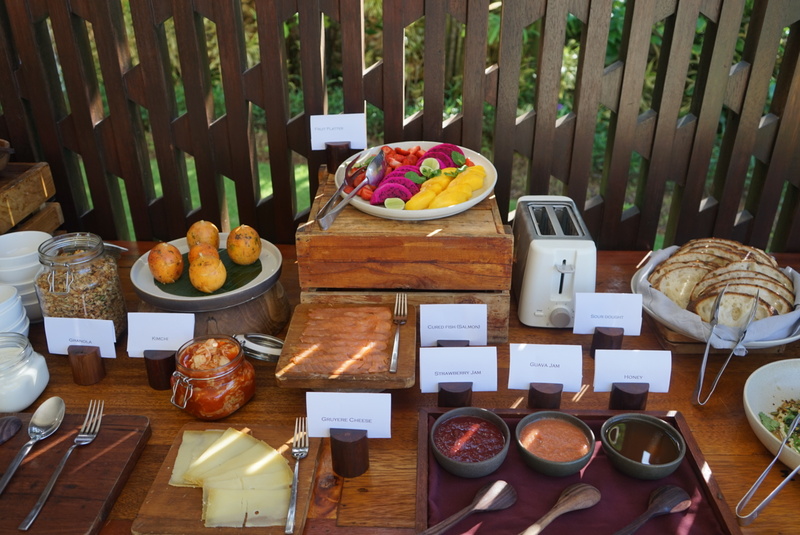 They also had an egg station set up so each morning you could get fresh eggs cooked up to suit you. All of the food: Breakfast, Lunch and Dinner was Amazing on the Wellness Retreat at THE UNGASAN Clifftop Resort and I felt such a high level of food quality and food handling standards and at all times I felt so comfortable eating the yummy delicious tasting quality food that was always on offer during our Wellness Retreat. One of the activities on The Wellness Retreat Program was a Vegan Cooking Class with Executive Chef, Josh Tyler and whilst I don’t consider myself much of a Chef I decided to go along and step outside my comfort zone. Executive Chef Josh Tyler taught us what to do and how to do it and it was actually so rewarding to be part of the team who was making our Lunch Meal. 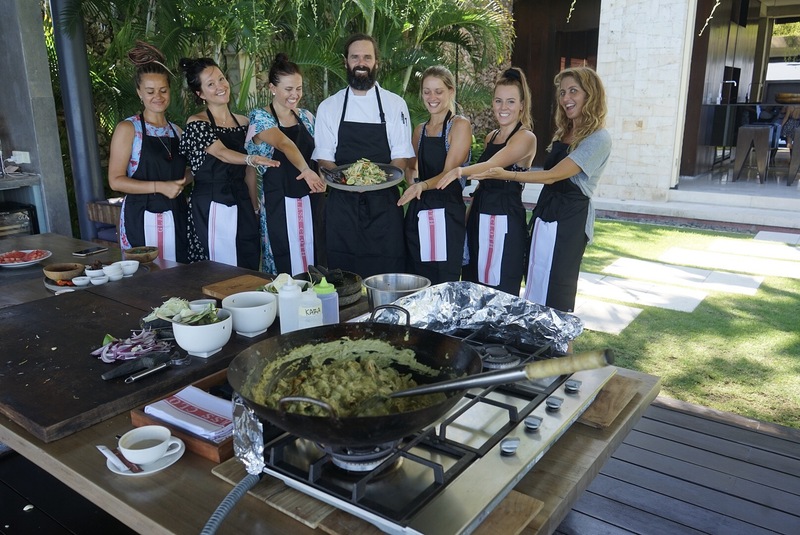 All of the girls on the Wellness Retreat made the Vegan Cooking Class so much fun and instead of it being serious and stressful like you might see on TV it was the complete opposite and we all laughed a lot, smiled and had so much fun. At the end of the class we all got to sit down and eat what we had made and cooked and the vegan curry tasted amazing, so amazing that non of us were talking whilst eating it but of course when we finished you couldn’t stop us from raving on how amazing the food we just made tasted it. This is one Vegan Cooking Class I will never forget and it was such a positive experience that even if you don’t consider yourself a cook, I recommend giving it a go and stepping outside your comfort zone. During the Wellness Retreat we all had access to Dede our private butler and I have to say that he was truly amazing and wanted to help with everything or anything whenever I wanted a lattee Dede was there. Dede was so helpful during my stay that I am even going to go to the extra effort of mentioning him in my Trip Advisor Review too. Some of the other activties I took part in was KickBoxing and whilst at first I really wasn’t sure if I would like it, or even wanted to give it a go, I was encouraged by Georgia who regulary does Kickboxing and after listening to her raving reviews of how much she loved it and how much it made her feel I thought I would give it a go. To my surprise I actually loved it also, it was a sweat session but I honestly felt like I had to put the effort in and even though I wouldn’t consider myself the most co-ordinated person in the world with the help of my kick boxing partner and the teacher saying the combinations out loud I actually got the hang of it. It was so rewarding at the end to finish the class and I also liked how we were able to work at our own fitness level and I wasn’t once made to feel uncomfortable. Throughout the 3 Days I got to immerse myself in so many beautiful Yoga and Meditation Practices, from Flow, Hatha and Yin Yang Yoga. The Yin Yang Yoga class was so soothing and delicious for my Mind, Body and Spirit every time I went along to Laura’s Yoga and Meditation Classes I felt so good during and afterwards. Laura was such an amazing Yoga Teacher and presenter when it came to providing clear instructions on alignment, posture and all of those important things and for me when it came to even learning how to prepare for a headstand and how to set up for it in all my years she really explained how to do it because up until then I had actually been doing it incorrectly which isn’t great when it comes to anything that involves your neck and head. And just before you get scared about having to do a headstand in the class don’t sweat it, you don’t have to do one, we simply made the most of having Laura there and she was so open to answering any of our questions at the end of the class or afterwards. If you have never tired Yoga or Meditation before but always wanted to give it a go then you will love having Laura as your Yoga Teacher she is truly a beautiful spirit and has a kind, soothing, healing soul and nature so you can’t help but feel happy and well by simply being in her presence she shines such much white bright light I truly loved spending my 3 Day Wellness Retreat with her. Laura also took us through a Mindvalley Workshop Session which was all about Mindfulness, Brain Health, Reducing Stress and Wellness and it was so interesting. Some other things that Laura had us do was write in our own personal journal with our thoughts feelings, intentions, goals and she encouraged us to spend time journalling in our books so we could always come back to them. As a Group we all had the pleasure of going out for Dinner also with our Yoga Teacher Laura and that allowed us all to get to know her better and to also ask more questions about Yoga, Meditation or her own personal journey. On The Wellness Retreat program at THE UNGASAN Clifftop Resort they also built in free time for us to enjoy and explore. For my free time I did things like going for a swim in their gorgeous infinity pool, I drank fresh juices, chilled out by having a coffee over looking the ocean. I had a warm relaxing flower bath in my Villa, I did some journalling and yes of course I captured some content for my @Spaitgirl IGTV Channel but for me that is not work I seriously love doing it and I am beyond grateful to share my experience and this gorgeous Wellness Retreat and Destination with you. I love how on the Wellness Retreat Program they book you in to visit their Vela Spa for a 1 hour Balinese Massage that to me was #SPAITGIRL perfect. The Vela Spa is up near the main resort swimming pool at THE UNGASAN Clifftop Resort. It may come as no surprise that I was super excited to meet the Vela Spa team and to find out more about the spa and them personally. My Spa Therapist at Vela Spa, THE UNGASAN Clifftop Resort was Yuli and she was absolutely amazing her flow was spot on and she did such a great job getting out all of my tight knots and relieving my tech neck pain that I had been suffering with. After the one hour Balinese Massage I felt so deeply relaxed, less tense and so much better from the inside out. I felt also very relaxed and sleepy so I could easily have drifted off to sleep but of course I didn’t as I wanted to try some more wellness activities of course. I loved spending my 3 Day Wellness Retreat at THE UNGASAN Clifftop Resort surrounded by like minded women. I also liked all of the teachers and those running the activities they all had such positive feel good energy. When I arrived to THE UNGASAN Clifftop Resort I didn’t know anyone but by the end of the 3 Days I felt like I knew everyone. I also felt that as a group we all bonded really well and these are the days and times, I will never forget and I was so grateful that it was such a positiive supportive, kind, loving feel good experience. I must admit it was sad at the end to say goodbye to the Women on my Wellness Retreat but the great news is now that we have all meet in real life and had such a great time we are all going to keep in contact so any time now I am back visiting Bali I now have a brand new circle of like minded friends and women to catch up with and this is one of the everlasting beauties of going on a Wellness Retreat it’s not only the activities you take part in but the people you meet. Going on The Wellness Retreat for me by myself was the best thing I ever did as it allowed me to make friends and mingle with others plus focus on my own self, but this Wellness Retreat is perfect if you want to share a villa with your bestie, Mum, Sister, Cousin, Daughter, Son, or loved one. If you have always dreamed of going on a Wellness Retreat or arranging one with your girlfriends, family, friends or those who work for you then you will love how The UNGASAN Clifftop Resort allow you to personalise your own retreat. Individuals and couples can join the first retreat on June 7-10th 2019 or groups (3-10 people) can completely personalize their own retreat to create an itinerary that suits them on a date that suits them. The Ungasan is the perfect place to relax, unwind and switch off from your responsibilities. You can enjoy morning Cliffside or beach yoga, day trips to visit all that Bali has to offer, boxing and fitness sessions, healing ceremonies, surf lessons, spa treatments, and more. Whether you want to go out and explore Bali or relax in your 2500sqm luxury villa, we can personalise the experience to your preferences. Get a group of friends together and enjoy a fun filled relaxing time away. We will ask you to tell us your preferences and from there will create a personalised tailor made itinerary just for you and your friends.Want to experience a luxury retreat at The Ungasan as an individual or group of two? Join us on June 7-10th where you can enjoy a variety of activities like yoga, meditation, boxing, Balinese healing ceremony, spa treatments and world class cuisine from menus designed by executive chef Josh Tyler. *Each villa has five bedrooms. A Single Room booking includes one bedroom, while Twin Share includes one bedroom with a King Size bed to be shared by 2 guests. We suggest if booking Twin Share that it is a booking for 2 people who are comfortable with this arrangement. An extra bed or two sets of bedding or an extra bed can be provided. 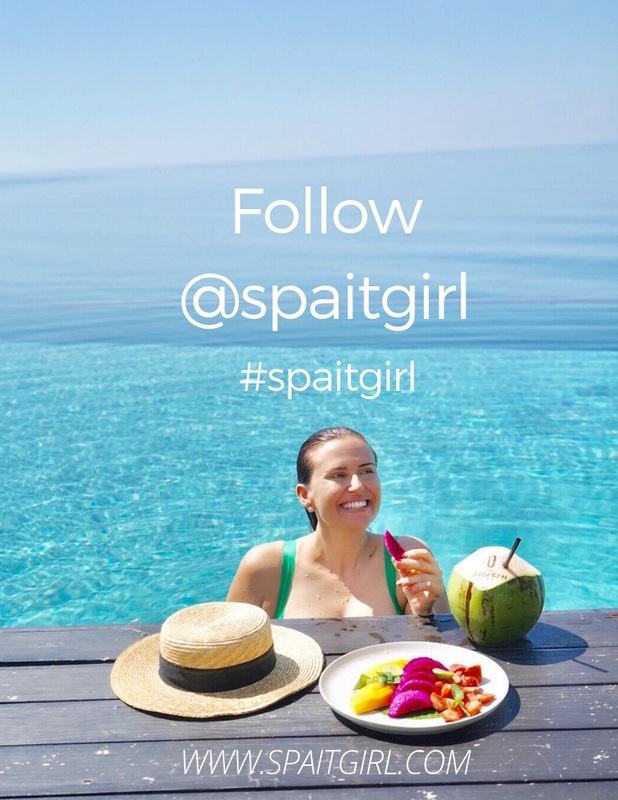 Receive 10% when you book a Wellness Retreat at THE UNGASAN Clifftop Resort – quote the discount code “SPAITGIRL10” at the time of booking. Because everyone needs a brand new Book to Read when on Holidays a.k.a Vacation.